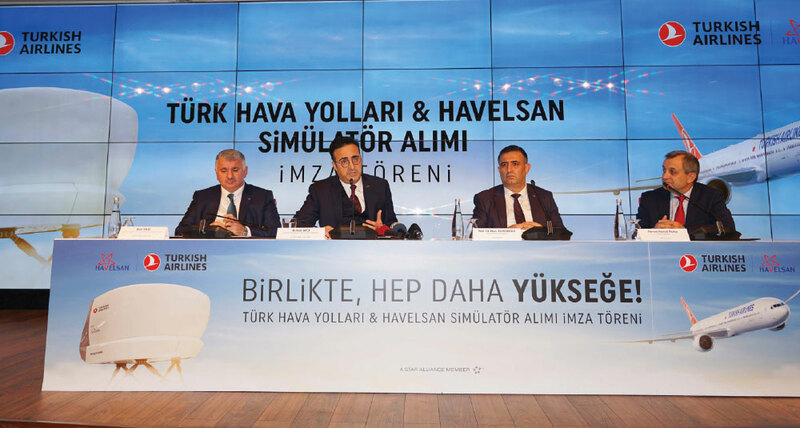 Turkish Airlines, who signed a new agreement with Havelsan who produced the first domestic simulator to be used in pilot training for the Boeing 737NG previously, continues its support for the further expansion of Turkey’s domestic and national production concept. Within the scope of this agreement which was signed by Turkish Airlines Chairman of the Board and the Executive Committee, M. İlker AYCI, and Havelsan Board Chairman, Prof. Dr. Hacı Ali MANTAR, within a special ceremony held at Turkish Airlines Headquarters, Havelsan will produce full-flight simulators with international D-level certification for the national flag carrier airline’ Boeing 737MAX and Airbus A320CEO/NEO type aircraft. With 14 simulators already in its fleet, Turkish Airlines will receive international D-level certified 5 ‘Full Flight Simulators’; 2 Boeing 737MAX, 3 Airbus A320CEO/NEO and 6 ‘Flight Training Devices’ from Havelsan to be set into operation in 2020 and 2021, according to the agreement. Thus, while the number of Full Flight Simulators in Turkish Airlines Flight Training Center will reach 28 with the other simulators to be received in 2021, the first domestic production of Boeing 737MAX and Airbus A320CEO/NEO type simulators will also be included in this number. Within the scope of this initiative, foreign dependency will be reduced, and it will remarkably accelerate the concept of domestic production. The EASA D-level certified Full Flight Simulators will enable Turkish Airlines pilots to obtain their adaptation, evaluation and renewal training at low costs and in a realistic manner. The simulators will be delivered to Turkish Airlines’ ever-expanding fleet, by Turkey’s prominent defense and aerospace company, Havelsan, who has combined its simulator design, production, integration and maintenance experience in the military field with civil aviation. Simulators come to the forefront as one of the most important factors to improve the quality of pilot training. The pilots are trained in the simulator after ground lessons in the types of aircraft that they will fly. Pilots can fly the aircraft after completing the simulator training, which has changing durations according to the type of aircraft and the pilot’s experience. In civil aviation, pilots also fly in simulators to renew their competence/ capabilities every 6 months. During this training, pilots are provided with emergency training under all kinds of environmental conditions. Thus, while the potential risks are minimized, the level of competent education is raised. Havelsan took decisive action to meet the increasing demand for pilot training that emerged in parallel with the significant momentum that has been seen in the Turkish Civil Aviation industry under the leadership of Turkish Airlines, the national flag carrier of Turkey. Havelsan targets to be a key player in the civil aviation sector as well, as it has already been in the military field. The company also aims to gain a significant place in the global civil simulator production market with the production of Boeing 737MAX and Airbus A320CEO/NEO type simulators.